This is the Trumpeter 00389 kit in 1/35 scale, of the ‘German Bergepanzer IV, Recovery Vehicle’. The Panzer IV was the workhorse of the German tank corps, being produced and used in all theatres of combat throughout the war. The design was upgraded repeatedly to deal with the increasing threats from enemy forces. 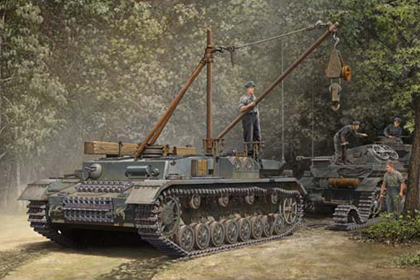 Bergepanzer IV : A recovery vehicle, essentially a turretless Panzer IV chassis fitted with a crane. In May 1944 Bergepanzer 36 stared being built. This entry was posted in Kits, Stash and tagged 00389, 1/35, bergepanzer, german, panzer iv, pz.kpfw.iv, recovery vehicle, sd.kfz.161, trumpeter by Thomas. Bookmark the permalink.